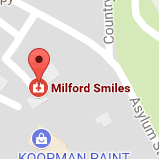 Here at Milford Smiles, we treat patients of all ages, providing dental services ranging from standard cleanings, all the way up to cosmetic surgery, Invisalign®, and orthodontics. Thanks to advances in dental technology, and the experience of our doctors and staff, keeping smiles bright and healthy has never been easier! The comfort of our patients always comes first; we understand that going to the dentist is never on the top of anyone’s “fun list” but we do everything we can to provide a calming and relaxing environment for our patients. We aim to make all of our patients feel a part of our dental family; each patient will have his or her own individualized dental plan, and our team is always open and eager to hear each patient’s dental concern. Through open communication and individualized dental plans, we will help you achieve and maintain a healthier and more beautiful smile! For more information about our dental office in Milford, MA, please give us a call at 508-473-7632. We are located in Milford MA, right off of 495 and Route 140.